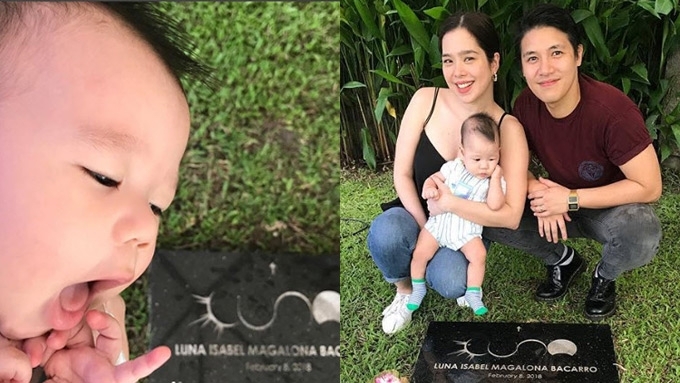 Saab Magalona and Jim Bacarro bring Baby Pancho to visit twin sister Luna's grave for the first time, nearly eight months after she passed away last February 8. It has been nearly eight months since Luna, the daughter of Saab Magalona and Jim Bacarro, passed away on the same day she was born. Luna passed away last February 8 due to complications at birth. Her twin brother, Pancho, finally gets to visit his late sister's grave. Saab, Jim, Pancho, and the Magalona family celebrated the birthday of Saab's dad Francis Magalona earlier this week. This was the perfect chance for Pancho to see his twin sister, whose resting place is situated near Francis's. Every now and then, Saab would open up about the passing of her daughter. In June, she posted a throwback pic of her baby bump. "My body was once home to three heartbeats," the blogger-musician wrote in her caption. "I’ve been allowing myself to grieve Luna’s passing and to enjoy all my moments with Pancho. It’s been such a rollercoaster to say the least, but I am getting better..."
READ: Saab Magalona remembers late daughter Luna: "I've been allowing myself to grieve..."
In May, Saab and Jim honored the memory of Luna through the Luna Isabel Magalona-Bacarro Memorial Fund.